Have you taken a river cruise in Europe yet? The 'Big Three' river cruises are the Rhine, the Danube and the Rhone/Saone. You may have heard about cruising on the Seine, even Main and Moselle cruises. But for a little 'off the beaten track' river cruising in Europe, Portugal's Douro river is enjoying its day in the sun. Warm-weather Portugal, in the heart of the Porto wine region's, scenic villages, history and picture-perfect vineyards, is an idyllic spring, summer and fall river cruising destination. The Douro river flows from Spain in the east, across northern Portugal to the western city of Porto on the Atlantic coast. Bookended by two UNESCO World Heritage cities, a river cruise on the scenic Douro Valley passes through mainly rural landscapes with historic villages, dramatic cliffs, famous vineyards, and for many people, the heart of Portugal's Latin culture. Even early and late in the season, the weather in Portugal is warmer and drier than in other popular river cruising destinations in Northern Europe, so if basking in pleasant summer weather is how you picture a river cruise, the Douro is for you. At the eastern end of the Douro: Spain. Most itineraries include nearby, renowned Salamanca, a UNESCO World Heritage city, with a 13th century university where Christopher Columbus once studied, and whose signature golden sandstone architecture glows in the summer sun. At the western end of the route, the port city of Porto (pictured top; image: Getty/Mirifada) is the second largest in Portugal (behind Lisbon), and also a UNESCO World Heritage Site. If its famous bridge reminds you of the Eiffel Tower, you are not crazy; its architect studied under Eiffel. It was a small world, even in the 19th century. A river cruise on the Douro is even more charming passing through the undisturbed countryside between the ports at either end. The Douro is far less traveled than the major European river cruise routes. You may rarely even see other river cruise boats or guests in the small villages where you can wander in a truly local, authentic, un-hurried rhythm and un-touristy environment. The name of the city of Porto suggests its long-lasting claim to fame. This is the home of port wine as you may have guessed, and also other delectable Portuguese wines like Muscatel. It's one of the world's oldest wine producing regions, with two millennia of viticulture traditions. 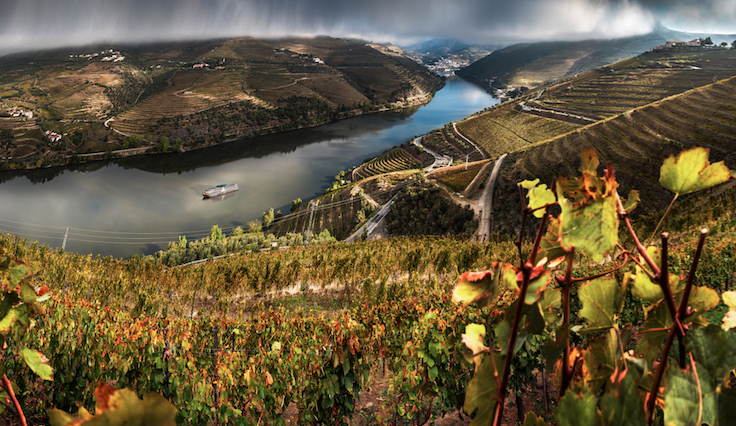 When it comes to port wine, a Douro river cruise brings you to the doorstep of some of the region's best places to experience a rich and storied wine that has become less commonly served. (These days, it's mostly in British costume dramas where we see men retreating to their studies and clubs for 'port and cigars'). You can sip your way along the Douro river with expert, hosted wine tastings in famous and out of the way wineries, including the UNESCO World Heritage Vinhateiro wine region, the scenic Varosa Valley, the beautiful vineyards of Regua that produce the best range of port wine in the country, Casa de Mateus, the castle made famous on the labels of Portugal’s renowned Mateus wine, and other viticulture treats.